Di Domizio, Jennifer, Jeremy PM Mogk, and Peter J. Keir. "Wrist splint effects on muscle activity and force during a handgrip task." Journal of applied biomechanics 24 (2008): 298-303. Wrist splints are commonly prescribed to limit wrist motion and provide support at night and during inactive periods but are often used in the workplace. In theory, splinting the wrist should reduce wrist extensor muscle activity by stabilizing the joint and reducing the need for co-contraction to maintain posture. Ten healthy volunteers underwent a series of 24 10-s gripping trials with surface electromyography on 6 forearm muscles. Trials were randomized between splinted and non-splinted conditions with three wrist postures (30° flexion, neutral, and 30° extension) and four grip efforts. Custom-made Plexiglas splints were taped to the dorsum of the hand and wrist. 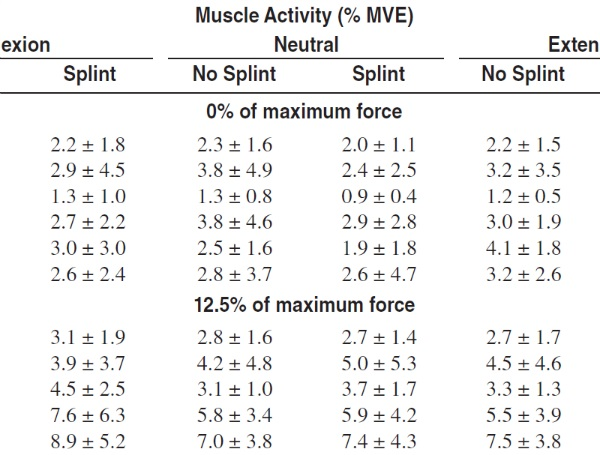 It was found that when simply holding the dynamometer, use of a splint led to a small (<1% MVE) but significant reduction in activity for all flexor muscles and extensor carpi radialis (all activity <4% maximum). At maximal grip, extensor muscle activity was significantly increased with the splints by 7.9–23.9% MVE. These data indicate that splinting at low-to-moderate grip forces may act to support the wrist against external loading, but appears counterproductive when exerting maximal forces. Wrist bracing should be limited to periods of no to light activity and avoided during tasks that require heavy efforts.